X-ray Fluorescence Analyzer. Boxray on-stream analyzers from Xore. Boxray analyzers are X-ray Fluorescence Analyzers. However they are somewhat unique in the way they use an x-ray excitation system with two targets. The radiation path consists of a series of 90-degree bends. The series of bends ensures that none of the radiation used to excitate the sample reaches the detector. The primary target is made of Tungsten and is fitted in the x-ray tube. 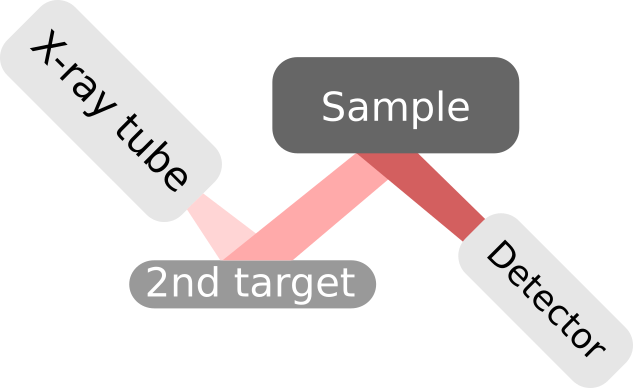 The secondary target's composition is optimized for the sample. The analyzers can be fitted with three secondary targets on a rotating target changer. What targets to fit is decided when ordering an analyzer. What target to use for a specific sample is configurable in the analyzer software. This level of optimization is only available on the Boxray analyzers. This sophisticated approach makes for a fine tuned X-ray excitation of the sample and at the same time reducing the radiation to a minimum for workplace safety. The X-ray tube emits a primary beam of x-rays. This beam hits the secondary targets. The primary x-ray photons interact with the secondary target, which in its turn emits a secondary beam of x-rays. The energy of the secondary photons depends on the materials in the target. The secondary beam of x-rays hit the sample to be measured. The secondary x-ray photons interact with the atoms in the sample. A photon knocks out an electron from its shell. An electron in an outer shell "falls" and takes the vacant place in the inner shell. By doing so, the electron loses energy and the difference in energy is released in the form of an x-ray photon. This is known as "Characteristic X-rays". The energy of the photon is specific for each element. The Characteristic X-rays from the atoms in the sample reaches the detector. The detector counts each photon and measures each photon's energy. The end result is a spectrum with x-ray energy on the X-axis and number of photons on the Y-axis. The spectrum is then fed to the analyzer software and the sample's contents is calculated.